Representatives of the Evangelical Lutheran Church in America (ELCA) and the Lutheran World Federation (LWF) joined Catholics and Methodists in Chicago Oct. 1 in a 10th anniversary celebration of a historic agreement, the Joint Declaration on the Doctrine of Justification (JDDJ). News release. 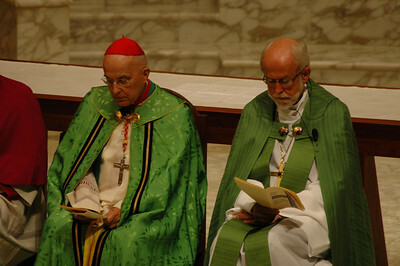 Cardinal Francis George, left, president, U.S. Conference of Catholic Bishops, and the Rev. Mark S. Hanson, right, presiding bishop of the Evangelical Lutheran Church in America and president, the Lutheran World Federation, hosted the Oct. 1 JDDJ service in Chicago. 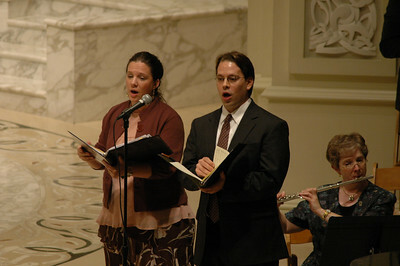 Musicians and cantors Heidi Jo Stirling, left, and Brian Streem, right, helped lead the Oct. 1 JDDJ celbration in Chicago. 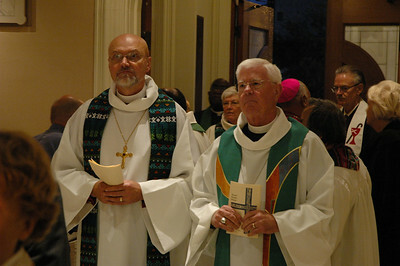 Bishop Wayne Miller, ELCA Metropolitan Chicago Synod, left, and Bishop Allan Bjornberg, ELCA Rocky Mountain Synod, prepare to process at the start of the JDDJ celebration. 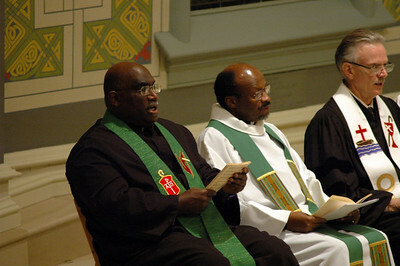 Bishop Gregory V. Palmer, left, president of the Council of Bishops, the United Methodist Church, participated in the Oct. 1 JDDJ celebration in Chicago. Next to him is the Rev. Ishamel Noko general secretary, the Lutheran World Federation' the Rev. Michael Kinnamon, general secretary, National Council of Churches USA; abnd Bishop Hee-Soo Jung, Chicago Episcopal Area of United Methodist Church. The Rev. 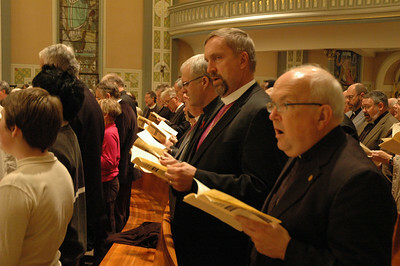 Mark S. Hanson, right, ELCA presiding bishop and president, the Lutheran World Federation, offers "Psalm prayers" during the Oct. 1 JDDJ celebration in Chicago. 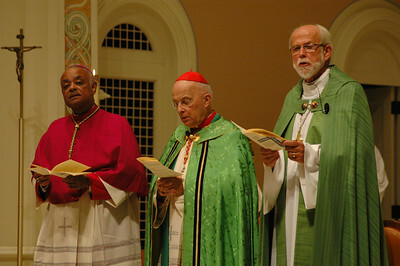 Archbishop Wilton Gregory, Archdiocese of Atlanta, second from left and Cardinal Francis George, president U.S. Conference of Catholic Bishops, join in the prayers. 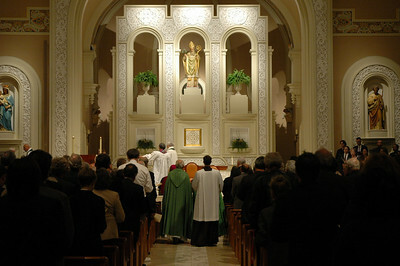 Old St. Patrick's Church, Chicago, was the site of the Oct. 1 JDDJ celebration. 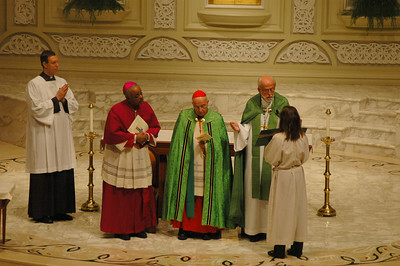 Bishop Gregory V. Palmer, left, president of the Council of Bishops, United Methodist Church, offered prayers during the Oct. 1 JDDJ celebration service in Chicago. 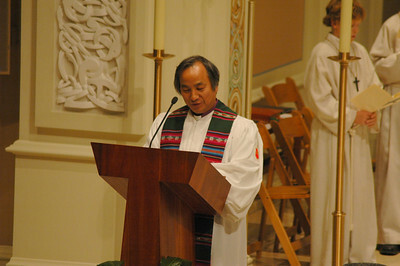 Next to him are the Rev. 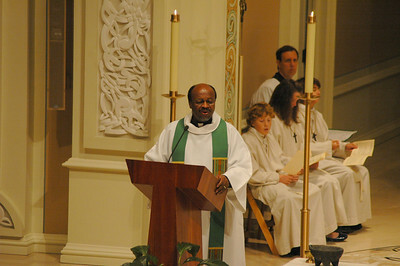 Ishmael Noko, general secretary, the Lutheran World Federation and the Rev. Michael Kinnamon, general secretary, National Council of Churches USA. The Conference of Bishops of the Evangelical Lutheran Church in America participated in the Oct. 1 JDDJ celebration in Chicago. 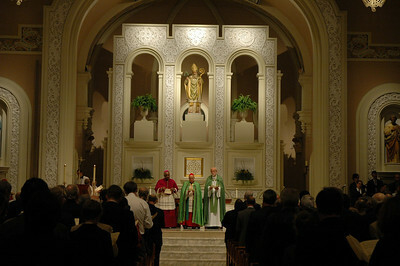 More than 300 people attended the Oct. 1 JDDJ celebration at Old St. Patrick Church, Chicago. 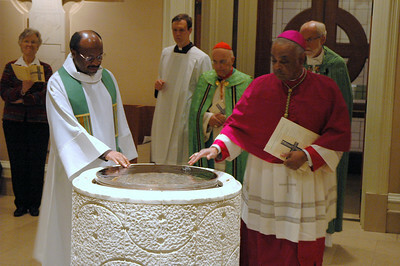 LWF General Secretary Ishmael Noko, left, and Archbishop Wilton Gregory, Archdiocese of Atlanta, right, stop at the font as they processed at the start of the JDDJ celebration. 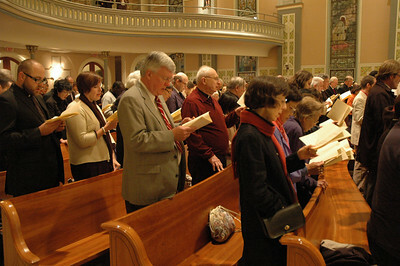 More than 300 parishioners attended the Oct. 1 JDDJ celebration in Chicago. 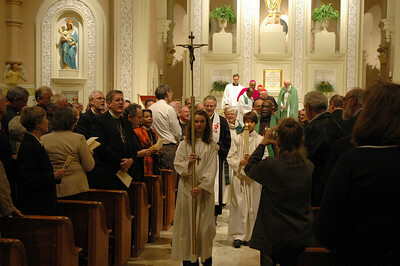 Leading the Oct. 1 JDDJ celebration in Chicago were, from left, the Most Rev. 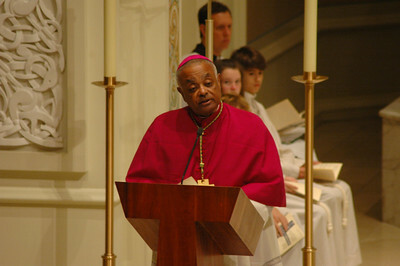 Wilton Gregory, archbishop of Atlanta; Cardinal Francis George, president, U.S. Conference of Catholic Bishops and the Rev. Mark S. Hanson, presiding bishop, Evangelical Lutheran Church in America and president, the Lutheran World Federation. 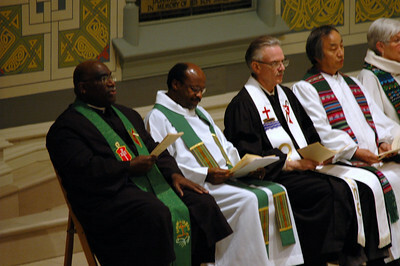 Bishop Hee-Soo Jung, Chicago Episcopal Area of United Methodist Church, reads a prayer during the Oct. 1 JDDJ service in Chicago. The Rev. 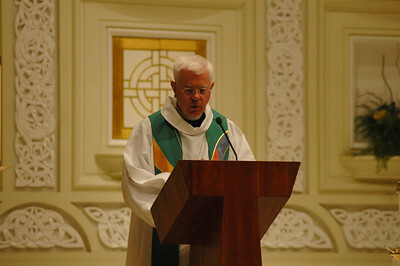 Michael Kinnamon, general secretary, National Council of Churches USA, reads a prayer during the Oct. 1 JDDJ service in Chicago. The Rev. Ishmael Noko, general secretary of the Lutheran World Federation, offers a concluding address at the Oct. 1 JDDJ celebration in Chicago. 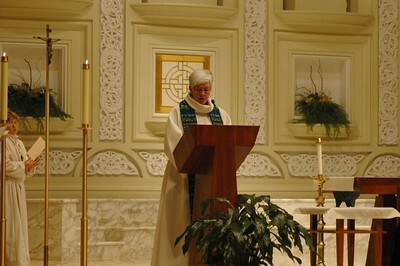 Bishop Sharon Zimmerman Rader, ecumenical officer, the United Methodist Church, reads a prayers during the Oct. 1 JDDJ celebration in Chicago. 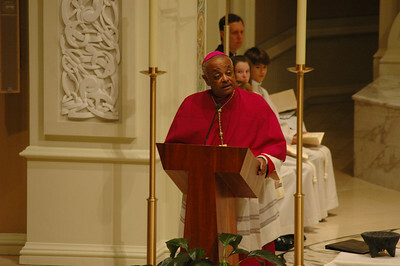 Archbishop Wilton D. Gregory, Archdiocese of Atlanta, delivers the homily at the Oct. 1 JDDJ celebration in Chicago. 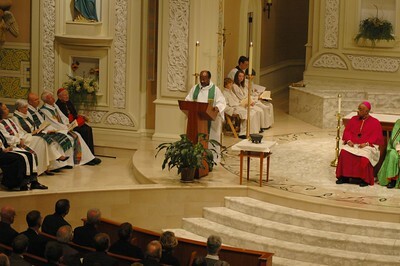 Archbishop Wilton D. Gregory, Archdiocese of Atlanta, delivers the homily during the Oct. 1 JDDJ celebration in Chicago. 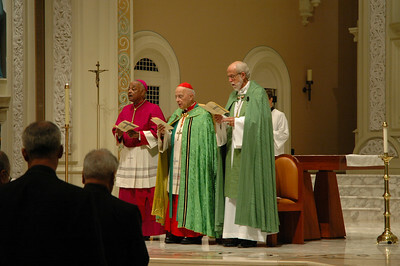 Leaders of the Oct. 1 JDDJ celebration at Old St. Patrick Church, Chicago, were, from left, Archbishop Wilton D. Gregory, Archdiocese of Atlanta; Cardinal Francis George, president, U.S. Conference of Catholic Bishops and the Rev. Mark S. Hanson, presiding bishop, Evangelical Lutheran Church in America and president, the Lutheran World Federation. The Rev. 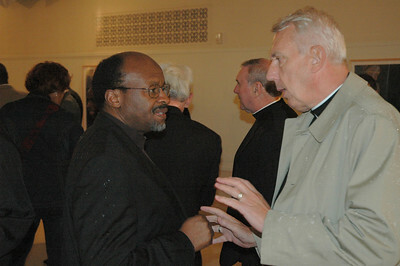 Ishmael Noko, left, general secretary, the Lutheran World Federation, speaks with the Rev. Lowell Almen, former secretary, Evangelical Lutheran Church in America and co-chair of the U.S. Lutheran-Roman Catholic Dialogue. Leaders of the Oct. 1 JDDJ celebration in Chicago recess following the Evening Prayer service. The Rev. Ishmael Noko, general secretary, the Lutheran World Federation, offers a concluding address at the Oct. 1 JDDJ celebration in Chicago. 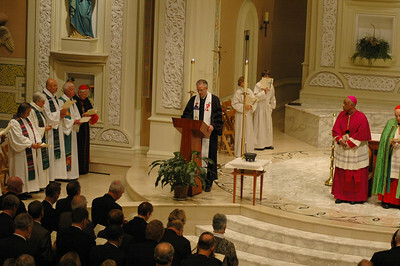 Bishop Allan Bjornberg, ELCA Rocky Mountain Synod, reads a prayers during the Oct. 1 JDDJ celebration in Chicago.